Ulvi Sakarya, was born in 1976 in Polatli. First, after completing secondary and high school education in Polatli, Malatya Inonu University Faculty of Economics and Administrative Sciences, graduated from the Business Administration Department. Business life insurance sector, with discarded Ulvi Sakarya private school management, agriculture, advertising, is also active in the media and journalism sector. With an active role in many business areas open to development and construction Polatlı in terms of the respectable young businessmen. 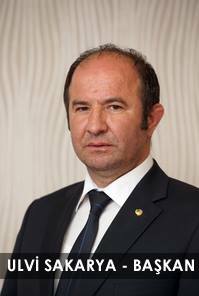 In 2009 Polatli Chamber of Commerce has undertaken the task of the Board of Directors and has been elected Chairman of Polatli Chamber of Commerce 2013 elections. TOBB Council of Chambers of Commerce membership, Customs Tourism Enterprises (GTI), as well as the Board of Directors of the Chamber of Commerce Membership Polatli Organized Industrial Zone continues in the role of Chairman of the Board. Sakarya speaks English, is married and has 3 children.